1955-56 Parkhurst Hockey was the sport's only card set for the year. That said, the set borrows a lot of the previous year's Topps design. They also introduced coach and manager cards as well, as cards showing two NHL venues. Finally, a parallel series of the cards was featured in boxes of cereal. Fronts show player portraits superimposed against a solid white background. For most players, a team logo appears in one of the upper corners. A red strip below the player has their name, team and a card number. Card backs are bilingual and printed in red ink. A player's name and vital stats run along the top, and a red block with his statistics from the previous year runs across the middle. There are two biographies, with an English version above the block and a French translation below. A "Did You Know?" question and a send-in offer for an album take up the bottom. The set was also distributed in boxes of Quaker Oats cereal. They are printed in green ink on the back and have a different bottom that identify them as Quaker Oats Hockey Cards. They are scarcer than the regular Parkhurst variations and can sell for multiple times their price. 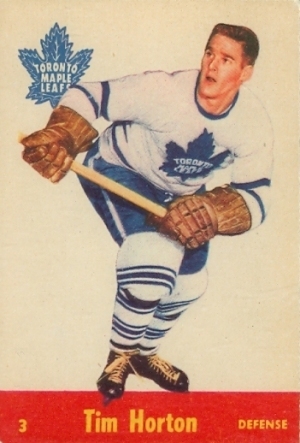 The 1955-56 Parkhurst Hockey checklist was cut to 79 cards and only features players from the Toronto Maple Leafs and the Montreal Canadiens. Old-time Greats are included in the set, as are cards of the two team's coaches and venues. Cards 69 through 77 feature game action shots, with descriptions on the backs. The key rookie in the set is Jacque Plante, even though he had already appeared on an action card the previous year. Oddly, his photo features a background, is vertically oriented and is missing a team logo. 1955-56 PARKHURST QUAKER OATS TIM HORTON CARD # 3 RARE!!! 69 Charlie Hodge "Hugh Beats Hodge"
70 Bernie "Boom-Boom" Geoffrion "Lum Stops Boom Boom"
71 Jacques Plante "Plante Is Protected"
72 Maurice "Rocket" Richard "Rocket Roars Through"
73 Harry Lumley "Richard Tests Lumley"
74 Harry Lumley "Beliveau Bats Puck"
75 Jacques Plante "Leaf Speedsters Attack"
76 Jim Morrison "Curry Scores Again"
77 Jean Beliveau "Jammed On The Boards"